As the winter months beckon, cyclists are preparing for the difficult conditions that the cold weather will bring. Ice biking is a popular recreational and sporting activity, and some keen cyclists look forward to the challenge that ice biking brings. Many seek out frozen trails, snowmobile and ski tracks and frozen areas to find somewhere to push their cycling skills. However, for those who rely on their bicycle for travel or commuting purposes, ice biking can be a difficult and challenging daily routine. Whatever the reason, it is important to stay safe and warm when cycling in the cold weather, as the icy conditions can easily cause injury. It can be treacherous cycling in cold weather. Rain and snow can hamper your vision (as well as affect your visibility) and chilly winds can be painful and dangerous. Heavy coats and jackets can affect mobility, so dress in several layers of wool fabrics, as well as wind and water resistant outer layers that are high visibility. This way, you can remove some layers if you start getting warm (this is likely if it is a long journey, or if the weather changes) but you are also prepared for the coldest. Wear thick wool or thermal socks and water resistant shoes, as your feet are most likely to get splashed in sleet and rain. Gloves are very important too, and thick riding gloves are preferential as they don’t restrict the hands movement so that brakes can safely be operated. Always check your brakes and lights are working before you set off. 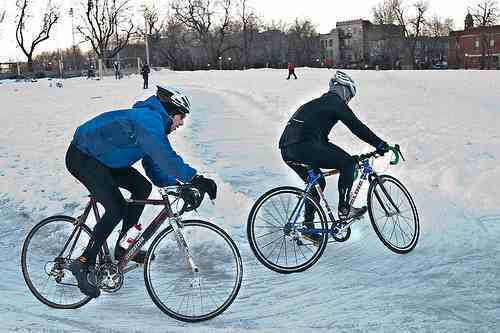 For recreational, off-road and trail activities, most mountain bike tyres will be fine for ice biking. Some bikers prefer to deflate their tyres to gain traction and control in the tough conditions, but be aware that letting out too much air can damage the rims. Special low pressure tyres and wide rims can be bought for those who plan on ice biking off-road regularly. Ice biking on roads can be much more difficult, as concrete and tarmac hide slippy ice patches which are hard to cycle through. If you are biking in areas that are often icy, you may have to invest in a pair of studded tyres. Normal tyres can get through the occasional patch of ice without any problems, but constant icy conditions are much harder. The hard-wearing metal studs can help gain traction and control and avoid skids. It is much more difficult to cycle on icy terrain, and cyclists should keep in mind that they will not be able to go as fast when ice biking. If you are making a regular journey, such as a daily commute, set off much earlier than you usually would. Ride slower and keep upright, especially when turning corners or coming to a stop. This can take some getting used to, as most cyclists are accustomed to using their body weight to lean in when making a turn. Braking can be difficult as the bike’s tyres will find it much harder to find traction, so you need to brake with plenty of stopping distance. Try to avoid using your front brake, as it can cause loss of control which is hard to recover from. Rear braking, even in a skid, is much more controllable and effective on ice. When cycling in cold weather, your bike will get most likely be covered in slush and snow. This can affect the brakes, gears and tyres. Try to remove as much as you can when you get to your destination. As well as affecting cycling performance, slush and dirt containing road salt and grit can corrode and damage brake pads and bicycle chains. Jenny Sampson is an author on behalf of Sealskinz.com who offer a wide variety of thermal gloves for cycling during the winter. This entry was posted in Land Sports, Winter Sports and tagged Ice Biking. Bookmark the permalink.